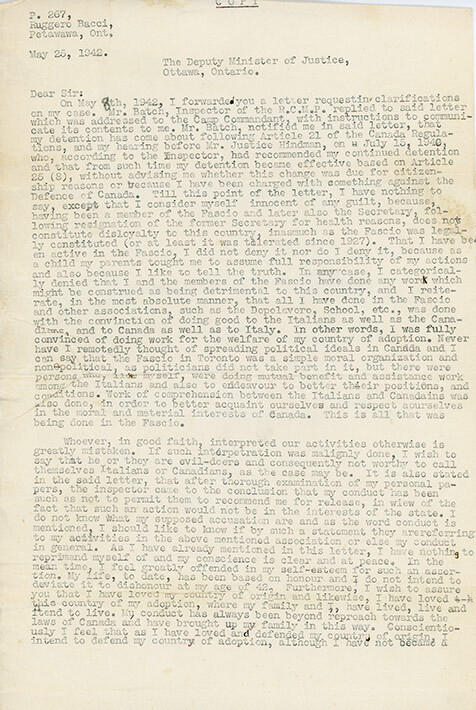 Draft letter from Ruggero Bacci, to Deputy Minister of Justice, May 25, 1942, two pages. The second page of the final copy which was mailed to the authorities is in possession of the family. That version also bears Bacci's signature and a stamp from the censor. It is not known what happened to the first page, and how the letter came into the possession of the Bacci family. However, the information in the final mailed version is the same as the text in this draft. Internee Ruggero Bacci wrote this typewritten letter in Camp Petawawa. He reviews the legal circumstances of his case. Originally detained under Regulation 21 of the Defence of Canada Regulations, Bacci is now held under Regulation 25(8). He does not understand the change and asks for an explanation. He admits that he was active in the fascio, noting that membership and such activity was not considered illegal prior to the war. He also vehemently denies any action by himself or other members of the fascio that would be "detrimental to this country". He claims the fascio was non-political, and was instead "a simple moral organization". This contention is suspect given what is known about the fascio and those involved. However, at this point, Bacci had been interned for almost 2 years, and his family was struggling at home. Also, it is clear that the charges against Bacci and others were not fully communicated to the internees themselves. As Bacci notes, he is told that due to his past conduct, the authorities have determined that his release would not be in the interest of the state. However, "I do not know what my supposed accusation are and as the word conduct is mentioned, I should like to know if by such a statement they are referring to my activities in the above mentioned association [fascio] or else my conduct in general". In response, he writes "I have loved my country of origin and likewise, I have loved this country of my adoption, where my family, and I have lived, live and intend to live. My conduct has always been beyond reproach towards the laws of Canada and have brought up my family in this way." He notes that he is willing to fight for Canada in the war, but would not fight against Italians. This is likely a reflection of what he was asked in his hearing over a year previous. Among the standard questions posed to internees during their hearings were: Are you willing to fight defending Canada? ; followed by: Are you willing to fight for Canada against the Italian state? Bacci writes "As I said to the Hon. Mr. Justice Hyndman, I am sorry that these two countries, Italy and Canada, which are close to my heart, are at war, and I must truthfully say that this, Sir, was never my wish, but after all, as this war is a reality, am I perhaps responsible for such a state of affairs?" Bacci also notes his wife's health has suffered during his internment as had the education of his children. In his absence, his wife Erminia (Minnie) suffered a serious nervous breakdown and was hospitalized at length. His oldest son Aldo was forced to quit high school to help support the family. Bacci would be interned for another year. After his release in May 1943, he returned to Toronto, where he remained for the rest of his life.